Initially, Carvalho attempted to terminate the pregnancy via other extreme measures like swallowing an entire pack of hypertension pills and sticking a needle in her uterus. When neither of those worked and she found herself four months pregnant with a job she needed to keep, and a partner who had no interest in being around, she sought the services of a an underground abortion provider who inserted a stalk of castor-oil plant in her uterus. She got professional medical help after hemorrhaging for three days, but it was too late. 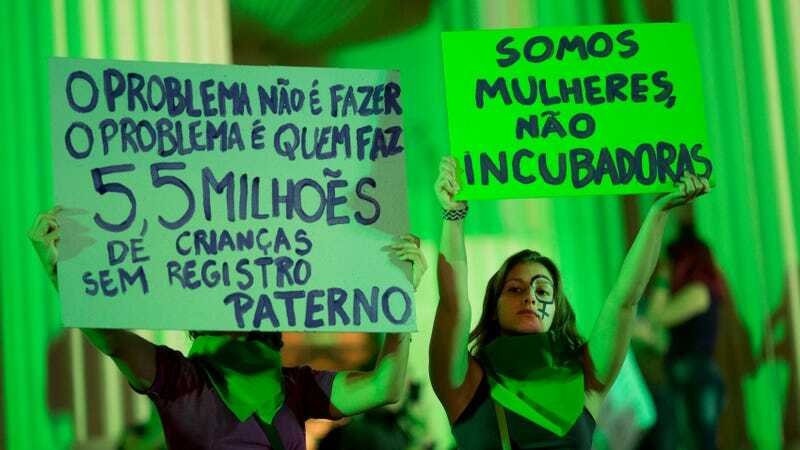 Estimates of the number of abortions performed in Brazil each year range from 500,000 to 1.2 million. Each year, more than 250,000 women are hospitalized as a result of complications from abortions, according to the Brazilian Health Ministry. In 2016, the last year for which official figures were available, 203 women died as a result of botched abortions. Providing medical care for them has cost the government more than $130 million over the past decade. Wealthy and middle-class women can have safer abortions by traveling abroad or resorting to medical professionals willing to perform them. Poor women, many of whom are black, make up a disproportionate number of those who die, become ill or get prosecuted as a result of the procedure, according to researchers, activists and public defenders. In an effort to avoid stories like this in the future, women’s rights activists in Brazil are asking the court to reconsider laws they believe are at odds with the constitution. Although this particular reevaluation may not lead to full legalization, decriminalization would be the first step towards making abortion legal—an uphill battle in a country that is largely Catholic. The two-day public hearing begins this Friday.